I had spent much of my life rescuing all kind of animals on my own but I had come to a point where I wanted to do more, help more animals and prevent cats from ending up in shelter, which I viewed a dangerous place to be in that overcrowded environment. My first HEART foster was a young male cat found in Boston, NY on a cold March night. He was a very pretty tiger and white boy, friendly and grateful to be inside. So that first foster led to hundreds of other cats and kittens which I have had the pleasure of fostering for HEART. 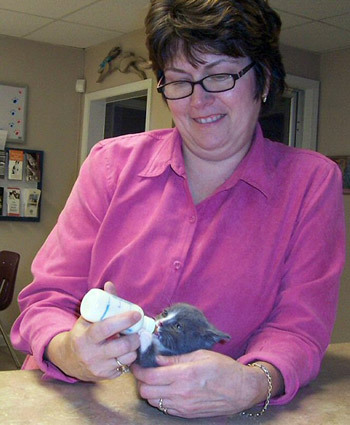 I came to specialize in the high risk orphan kittens that required “one-on-one” bottle feeding care. It was amazing to me the feistiness of these tiny little kittens. I enjoyed watching the daily development, for a kitten can learn many new things in one day. I enlisted the help of my children to assist in the care of our furry friends. We often had as many as seven one-week old kittens. I felt it was important for my children to learn the lesson of giving life, giving back, and being responsible for the outcome, including the decision where the foster would be permanently placed. I believe that each of us can do “something” to help animals in need — from fundraising to transporting to fostering. Don’t let everyday excuses stand in your way helping!! Choose to make a difference and I can assure you that your “heart” will be filled with happiness.